In biology and ecology, extinction is the end of an organism or of a group of organisms (taxon), normally a species. The moment of extinction is generally considered to be the death of the last individual of the species, although the capacity to breed and recover may have been lost before this point. It is noteworthy that human concern about human extinction takes a different form from human concern (where there is any) about the extinction of non-human species. Most humans who are concerned about the extinction of non-human species are not concerned about the individual animals whose lives are cut short in the passage to extinction, even though that is one of the best reasons to be concerned about extinction (at least in its killing form). The popular concern about animal extinction is usually concern for humans –- that we shall live in a world impoverished by the loss of one aspect of faunal diversity, that we shall no longer be able to behold or use that species of animal. In other words, none of the typical concerns about human extinction are applied to non-human species extinction. We have since built museums to celebrate the past, and spent decades studying prehistoric lives. And if all this has taught us anything, it is this: no species lasts forever. Let's not be too quick to blame the human race for everything. We must remember that a great many species of animals became extinct before man ever appeared on earth. At the same time it is probably true that when two husky representatives of Homo sapiens, with clubs, corner the last two birds of a species, no matter how far they have or have not evolved, both the phylogeny and the ontogeny of those birds are, to all intents and purposes, over. Becoming extinct has its compensations. It's a good deal like beating the game. 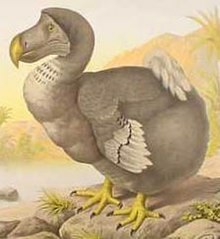 I would go so far as to say that becoming extinct is the perfect answer to everything and I defy anybody to think of a better. Other solutions are mere palliatives, just a bunch of loose ends, leaving the central problem untouched. Indeed, in the long run, extinctions of species are as inevitable as the deaths of individual animals, and it may be that the causes of extinctions are as varied as the causes of individual deaths. A wave of extinctions—a sudden diminution in the number of species—is analogous to a sudden big drop in the size of a human population, an event that deserves to be explained even though the individual people would inevitably have died sooner or later anyway. Catastrophes in human populations have many causes: war, famine, and pestilence are the possibilities that first spring to mind. There may be equally many causes for evolutionary catastrophes, as waves of extinctions could well be called. Another possibility, however, is that extinctions come in waves that are part of a recurring cycle. It would then be the cycle itself, rather than each individual wave in the cycle, that would need to be explained. If there is such a cycle, it presumably follows a cycle in the inorganic world, such as cyclic climactic changes. Since after extinction no one will be present to take responsibility, we have to take full responsibility now.